What’s so special about slippery, slimy old frogs and toads, we hear you ask? Quite a lot, actually! Because you see, our amphibians have a very important role here at Oreo and Friends. These guys are on a mission – they’re out to prove that slimy can be cool! Our array of amphibians might not be much to look at, but we all know that looks can be deceiving. And anyway, between the frogs’ cartoon-like faces and the toads’ numerous warts, there’s a lot of character there! And as for the slime, well there’s actually a lot more to it than meets the eye – these slimy critters are actually really interesting to learn about! 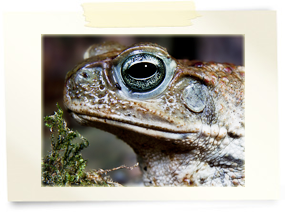 Did you know that the cane toad gets its name from the fact that it was used to help get rid of pests from sugarcane? This was pretty easy for the toad too, due to the fact that their skin is actually toxic! When threatened, they secrete a fluid that is deadly to these animals when ingested. It can hurt humans too, so you must remember to never lick a cane toad, no matter how tasty it might look! When it comes to the frogs, their slime is not only slimy, it can also be very useful! 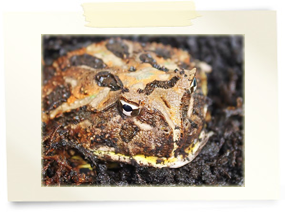 Horned toads tend to spend a lot of their time buried in shallow earth, lazily waiting to ambush their prey. When the time comes to hibernate, they can actually grow a cocoon of slimy skin around themselves to retain moisture when it’s cold. Sort of like putting on a really slimy coat, I suppose! Yeah, we know they’re not as smart as a raccoon, as sweet as a kinkajou or as funny as a meerkat. Our amphibian friends might be more funny looking than good looking, and they might be more gooey than fuzzy, but we hope you can still find a place in your heart for them! If you let them, they can show you than slimy really can be cool!